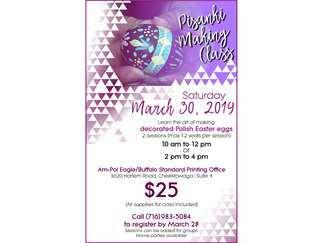 Pisanki Making Class, Sat. March 30, 2018. Learn the art of making decorated Polish Easter eggs. 2 sessions. 10 am – 12 pm or 2 pm – 4 pm limited seating. Am-Pol Eagle/Buffalo Standard Printing Office, 3620 Harlem Rd. Suite 4, Chtg. $25 - all supplies for class included, call (716) 983-5084 to register by March 28st. Sessions can be added for groups. Home parties available!